The pump must be permanently connected to the electricity supply via a double pole isolating switch with a minimum contact gap of 3mm in both poles. The switch must be readily accessible but out of reach of a person using a fixed bath or shower, except for the cord of a pull cord operated switch. The wiring must be connected to the switch without the use of a plug or socket outlet. The supply cable selected for installation must conform to the relevant table in the I.E.E. regulations. To enhance electrical safety a 30mA RCD (Residual Current Device) should be installed in all UK electric and pumped shower circuits. This may be part of the consumer unit or a separate unit. 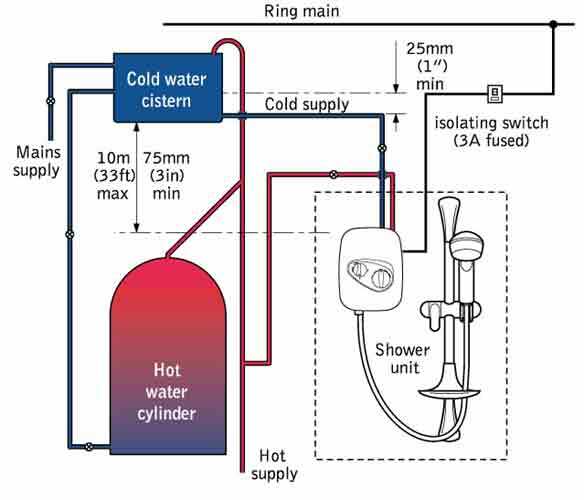 To ensure correct operation the pump must be connected to a cistern fed supply of hot and cold water at nominally equal pressures. The pump must never be connected to the mains cold water supply. 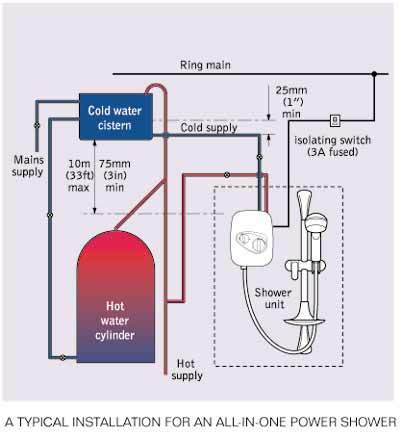 The cold water cistern must always be above the pump to ensure priming of the unit (see diagrams for details). The hot water storage cylinder and cold water cistern should each have a minimum storage capacity of 114 litres in order to ensure adequate infill rate. If supplying a number of outlets, it is recommended that the cold water cistern should have a minimum capacity of 230 litres in order to ensure adequate infill rate. Both hot and cold water supplies to the pump must be dedicated and separate from any other outlets or connections. All in one power showers and power shower pack pumps are covered by a 12 month guarantee (power shower pack mixer valve has 3 year guarantee) from the date of purchase. For a small premium this can be extended to 3 to 5 years (for full details please see the warranty application form included in every Triton shower pack). Installation should be carried out by competent tradesmen in accordance with the detailed fitting instructions (supplied with every unit) and Water Regulations and Bye-Laws. A copy of the fitting instructions is available on request from the Customer Service Department if it would help when planning your installation. Trade installers can phone a dedicated hotline on 024 7632 5491 for immediate technical advice on installation, and to ensure product suitability for commercial and multiple installations.